Geomorphology and sedimentology of estuaries: an introduction (G.M.E. Perillo). 2. Definitions and geomorphologic classifications of estuaries (G.M.E. Perillo). 3. Sedimentary systems of coastal-plain estuaries (H. Bokuniewicz). 4. Geomorphology and sedimentology of rias (P. Castaing, A. Guilcher). 5. Sedimentology and geomorphology of fjords (J.P.M. Syvitski, J. Shaw). 6. Tide-dominated estuaries and tidal rivers (J.T. Wells). 7. Delta front estuaries (B.S. Hart). 8. Structural estuaries (M. Pino Quivira). 9. Coastal lagoons (F.I. Isla). 10. Siliciclastic tidal flats (C.L. Amos). 11. Salt marshes (J.L. Luternauer, R.J. Atkins, A.I. Moody, H.F.L. Williams, J.W. Gibson). 12. Geomorphology and sedimentology of mangroves (P.G.E.F. Augustinus). 13. Estuarine dunes and bars (R.W. Dalrymple, R.N. Rhodes). 14. Sediment transport processes in estuaries (K.R. Dyer). Geographic index. Subject index. 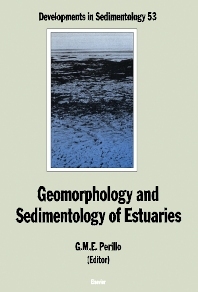 This is the first book to be entirely devoted to the geomorphology and sedimentology of estuaries. The chapters in the book are structured according to the morphogenetic classification which is based on a new definition of estuaries and covers all areas within this field. The material is presented in such a way that it serves both as a reference for the researcher and as a textbook for use on courses covering estuaries, coastal environments, sedimentology and oceanography. Internationally renowned specialists have provided in-depth descriptions of the geomorphology, sedimentology and interactive processes associated with each particular subject.